The 14th Annual Capital Coaches Conference (CCC) is the leading North American conference for coaches and allied professionals. The International Coach Federation (ICF) Metro DC Chapter, the CCC’s host and organizer, brings together more than 400 coaches, educators, and thought leaders, to explore change-making topics in the coaching profession. Join in the discussion on addressing teams’ strengths, team derailers (including toxins, agenda’s and politics) and how to create sustainable teams performance. Learn and share some of the hidden fractures that erode team performance, and how to diagnose and prescribe “treatment” so that you can focus on more strategic initiatives. Click here and register for this event! How you communicate can add stress or reduce stress in your team. How would I know the difference? Know your audience! Discover how to discern “too much” from “not enough” when running a meeting. Learn how to use VAK (Visual, Auditory, Kinesthetic) language to reach more participants. Learn the four words to avoid to REDUCE stress in the workplace. Click here and to register for this event! 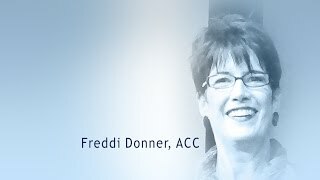 Freddi challenged attendees to turn everyday interactions into opportunities. She focused on practical, real-world objectives to help you to advance your job search prospects, business goals & and long term business stamina. Be brave stand out! At the root of every job search is an invisible force field: it’s called play by the rules or maybe it’s called fit in. Act professional. Dress the part. While some of this advice is essential to making lasting first impressions some of these rules need to be broken in order for you to get noticed. During this discussion, led by our guest facilitator Freddi Donner, will share some novel ways for you to stand out online and in the interview. We will reveal some creative ways for you to demonstrate your brand promise before you ever get the job! Freddi will review the 3 Cs of standing out: Courage, Creativity, and Consistency. Standing out takes Courage, something we need to develop, and few of us are born with. Creativity- you will come home with one new idea on how to attract attention to your offer/talent. Consistency is where you demonstrate your brand promise, and your character. Being in a successful business takes stamina! It takes, discipline, resilience and faith. It also requires focus. When we lose focus, and operate without our faith, failure is likely to follow. This is part of Freddi’s history and she shares how the closing of a business got her to re-focus on what was important. Learn how one entrepreneur went from failure to focus and the blessings that have emerged as Freddi re-engaged her Faith in the Lord with her business objectives. Learn how you can develop your business stamina and reap the rewards of a God centered service. The most effective leaders know how to relate to a variety of personality types. Learn some tips for connecting, managing and motivating others. Differences in Dialogue: How to be more effective in connecting with others. You are perfect just the way you are. Everything you say and do is just fine, until…..you decide to communicate with another human being. Then …it gets complicated. Come discover why your communication style is in the minority of your audience, and how to develop new ways of communication for better connections. Learn some simple language and methodologies that can help you develop flexibility in your communication tool box. Although you have been trained as a coach, much of what you need to do to expand your practice, depends on your ability to close business. Find out if you are taking the necessary steps for success from to area coaches who will share their success in expanding their practices. Understanding how your beliefs contribute or detract from your success in pursuing a new position.